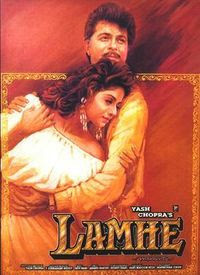 Lamhe's on a roll lately; this is the third review I've read in a month on the blogosphere. I'm looking forward to watching it! Oh this songs totally rocks the radio in India, to this day- which reminds me- I miss Indian radio so so much. Ila arun was on full throttle during this period I think- lots of movie songs, and some acting bits too. Hi Sanket: I remember being awed at Sridevi's versatility in this film. The soundtrack is phenomenal too, which means it's an all round treat! I wonder if it would have been more successful initially in India if released a few years later. Thanks for reminding me of this movie. I saw it only a year back but I had forgotten about "Megha Re Megha" which was my favorite part of the movie. I remember replaying that number a few times. I also remember not being able to get my mind around, "But HOW could he fall for the daughter of his old flame!?!?!" But then Anil's character had even MORE trouble than I did processing this, and eventually I was like, "Bas! Just get your shaadi on already!" Ajnabi - looking forward to seeing what you think of it. It's a neat movie that you can enjoy even if the story creeps you out a little. Shweta - I miss it too! I remember listening to Doordarshan and Binica Geetmala on my first two visits to India (in '77 & '81) with my whole family in the evenings - such sweet memories. TBF - I agree wholeheartedly about Sridevi and although her initial movies annoyed me, I started to like her more in the later years. I think the story would have been more accepted in India in it's later years but seem to remember it doing great business in India during subsequent re-releases. BFC - totally with you on the songs and your thoughts about Anil. I tend to suspend belief (or my annoyance with plotlines) much more with Bollywood movies than any other ones. I guess it's because I am so busy enjoying the songs, scenery, Hindi/Urdu language, stars etc. that the plots sometimes are secondary. Oh gooosh, now I feel I need to reevaluate Lamhe, since a lot of people seem to get over the freakiness. I have learned to get over the freakishness in Bollywood movies a long long time ago in a filmi duniya far far away. The Bollyweed reviews are my favorite too and my next one will most likely be Amar Akbar Anthony -such fond memories of that one as it is my earliest movie memory and the first Bollywood movie I ever saw in India. Didn't enjoy Lamhe as much as Chandni .. but what I liked most was Anil Kapoor not shouting :-) and the "Pallo" scene almost killed the film. The tune of the song "Kabhi mai kahoon" was used in the background in Chandni. Loved the tune, but the song felt like a let down in comparison. I grew to have more respect for Sridevi over the years as her acting just got better and better. The first Bollywood movie I saw her in was 'Himmatwala' and at the time her Hindi was so poor she had to have all her lines dubbed after the fact! Liked Chandini as well as Lamhe about equally but they were very different movies indeed.